The spark, this time, was a broken fax machine. The fax machine broke and was left broken for days. That meant prisoners could not file their appeals against deportation. Everything came to a standstill. For the prison, the fax was just another machine. For the prisoners, it meant life or death. The urgency that turns a fax machine into a lifeline is produced by the fast-track system, which places practically every asylum seeker into a 14-day pressure cooker, during which they must do everything, from find an attorney to learn English to get comfortable speaking the unspeakable suffering and pain. Fourteen days. The detention center is not a detention center. It’s a prison. And the prison is not a prison. It’s a factory, and its business is removal. On Tuesday, 20 prisoners in Brook House IRC staged an all-night protest in the exercise yard. They all refused to return to their cells. Over 50 prisoners at Colnbrook IRC have also engaged in a collective action. 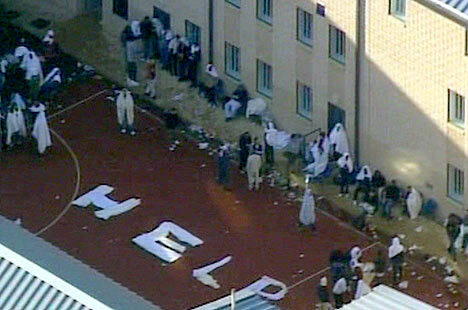 Yesterday, at Campsfield IRC, near Oxford, about 50 prisoners started a hunger strike. In each instance, the prison’s response has been to take the bulk of prisoners and dump them into solitary. That’s what you do with defective parts. They should be shocking cases. They’re not. The State responded by yanking the prison contract from Geo and giving it to Mitie, which is to say no response at all. Harmondsworth has been a private operation since the 1970s, and it’s been bad for forty years. There is no shock at the end of four decades of abuse. Ten years ago, doctors commented on the inappropriate shackling of sick and dying prisoners: “I had told the manager of the centre that in my professional opinion handcuffing was wholly inappropriate. We have a number of detainees brought here in cuffs. The question is: at what point does a doctor’s intervention cease to carry weight?” There is no room for shock. In 2007, the Inspectorate found Harmondsworth was more a high-security prison than an immigration removal center, complete with over use of solitary confinement and unrestricted antagonism from prison staff. In other words, they found in 2007 what they found last year. In 2004, the atrocity of Harmondsworth’s mental health care and health care was so bad it inspired doctors to form Medical Justice. Today, despite advocacy and services, the vulnerability of asylum seekers means less than nothing. It provides one more reason to speed up the line and move them out more quickly. In 2005, Amnesty wrote extensively about the horror of Harmondsworth. In 2006, the Chief Inspector of Prisons Anne Owers commented: ‘This is undoubtedly the poorest report we have issued on an Immigration Removal Centre’. And what comes of these reports? Some other corporation gets the contract, and then, two years later, the Inspector is shocked. In 2010, the Inspector found there was no information about legal rights and no up to date legal materials available for prisoners. The only legal help for prisoners was a consultation room open for only ten hours a week. In any week, only 20 clients could be seen. So, the room was booked two weeks in advance. But unrepresented prisoners in the fast track could not defer their asylum interviews for lack of legal counsel. So, by the time legal help was available, their claims had been refused and appeals dismissed. It’s a perfect amped up production line factory system. Since 1989, 21 people have died in immigration removal centers in the United Kingdom. At the top of the list, with eight deaths, is the Harmondsworth IRC. Stop being `shocked’. Close Harmondsworth. End the brutality of fast-track asylum, which turns time into torture. One Campsfield prisoner explained, “We want our freedom. We want our life with dignity.” It’s time. In prisons, jails and detention centers, the bodies pile up: Who cares?